If you’re addicted to the taste of low and slow barbecue, but don’t have whole weekends you can dedicate to managing the pit, pellet grills can be pretty tempting. 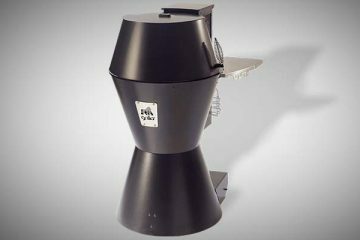 Pellet smokers promise to produce food with the distinctive smoke flavor you love, without any of the babysitting that comes with cooking with wood or charcoal. The Traeger Lil Tex Elite 22 is a popular pellet grill / smoker at a reasonable price point. Find out how well it performs in this detailed review. This pellet smoker offers 418 square inches of grilling space (which is roughly 4 whole chickens). The unit is 49 inches high and 42 inches wide and weighs 98 lbs. Extras such as covers, insulative blankets, pellets and extra shelves need to be purchased separately. It promises to cook in 6 different ways: Grill, bake, roast, smoke, braise and barbecue. In other words, it is claimed that it can cook low and slow or hot and fast. Height: 49 in. | Width: 42 in. | Depth: 22 in. We had a closer look at the unit. 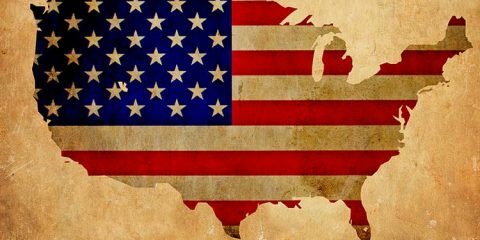 While it does live up to the hype on many fronts, there are some areas it could do a little better. We have broken it down for you below. This is a really convenient sized smoker. While it is compact, and could fit on a smaller patio, there is still enough space under the lid to cook up enough food to feed a good size dinner party. Traeger are known for their great customer service. While these grills have a reputation of being well made for the price, it is reassuring to know that if something does go wrong you will be supported by the manufacturer. These grills can be used like a convection oven and will bake cookies and pies with ease if the mood takes you. If you live in a cold climate and plan to cook when it is around 30°F outside, you will have to invest in the insulation blanket, otherwise you will be struggling to hit the temps needed to cook much at all. This grill will struggle to get up around 450°F. 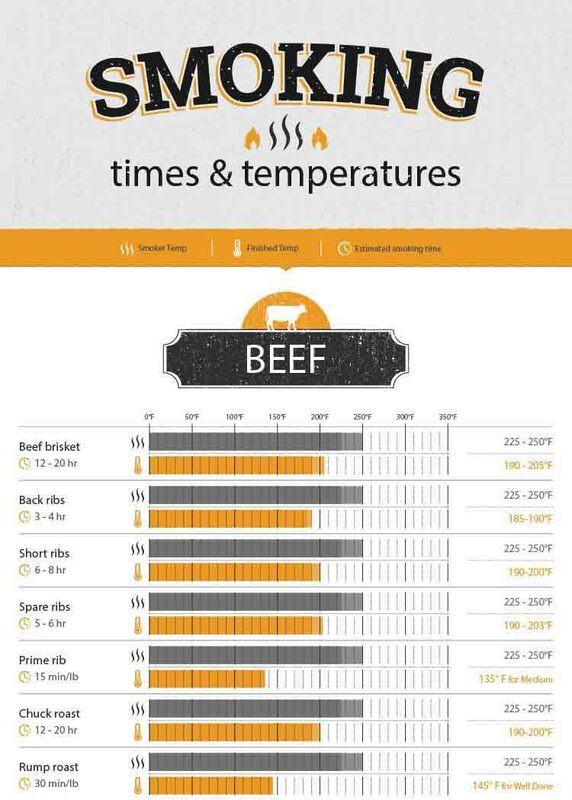 So if you are planning to sear your meat, you will need to have another dedicated searing setup ready. Bear in mind, these units do need to be plugged into electricity to work, so make sure you have an outlet in the spot you plan to put it. Needless to say, this is not the type of smoker you can plan to take on your next camping trip. One area in which the Lil Tex Elite 22 falls short is when it comes to cooking at very high heats. While it claims to cook hot and fast, it seems that reaching 500°F is out of reach, and this model does not include a searing station. You can still grill on this but if you want to sear your steak at blazing hot temps, you’re best off investing in a gas or charcoal grill. 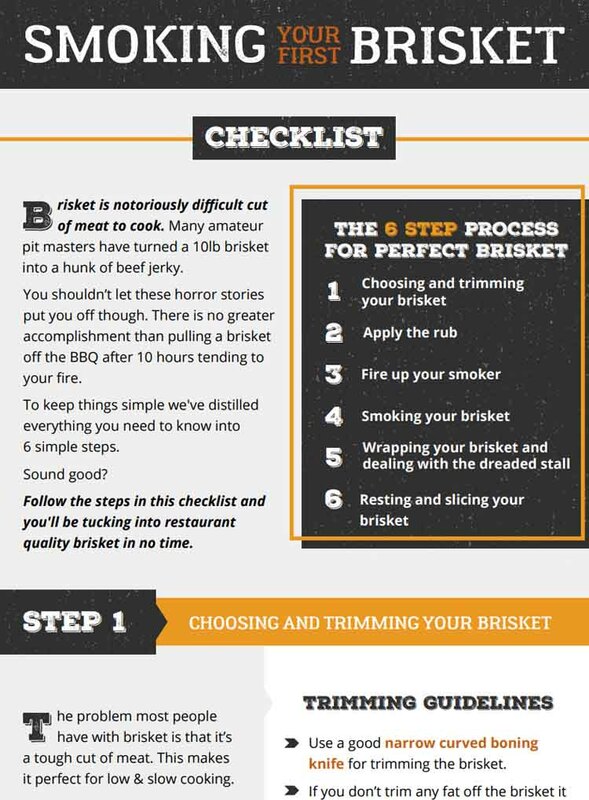 If you are new to barbecuing the prospect of mastering a whole set of new skills at once can be overwhelming. A versatile yet easy to use smoker like this one allows you to experiment and is a great way to get started. This is a drawcard of pellet smokers in general. Load up the pellets, set the temperature, pop in the food and then relax. Spend time with your guests, have a drink, or just kick back on the deck. As the creators of the original pellet smoker, Traeger have had time to fine tune their product. 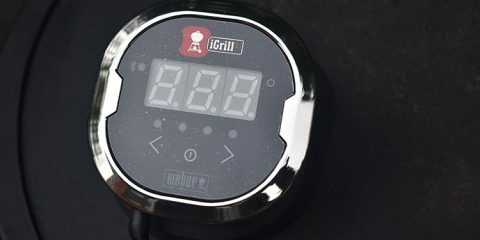 The Lil Tex grill uses an autostart ignition for turning on and off with a single button push. If you aren’t so interested in technical know how or the science of thermodynamics, but just want to cook tasty barbeque, then a pellet grill is a good option. 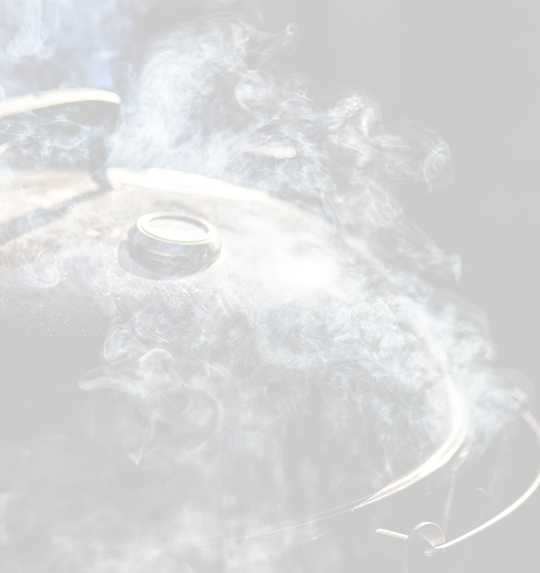 Similar to the point above, when using a pellet smoker there is no need to fiddle with vents and airflow,, struggle to light the charcoal, or obsessively monitor the temperature. So there really isn’t much you can “stuff up” – meaning each time you pull out your cooked meal it is going to be pretty good. Some may fear that this consistency could almost be a bit boring. However, you can get pellets made from different woods, and experiment with the never ending variety of rubs and sauces available online or by word of mouth. There is still room to put your signature twist on what you cook flavorwise, but a Traeger Lil Tex will take the guesswork out of the cooking itself. 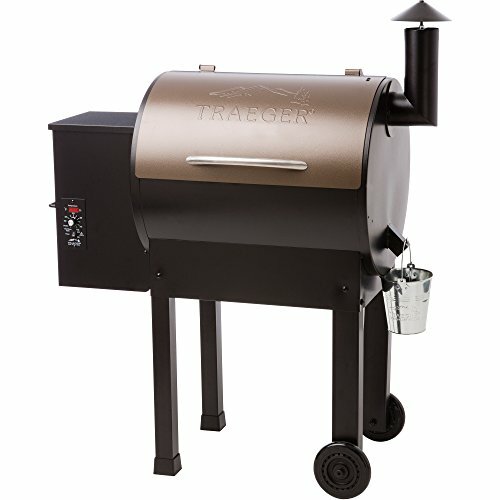 Traeger have had years of experience making pellet smokers, and have enjoyed a good reputation. They are probably the most widely owned pellet smoker in the US. However, in recent years, there have been some concerns raised about Traegers production quality, especially on cheaper models. So long as you always use the cover and avoid leaving the grill out in the rain it should last you for several years though. You should also clean out the auger and hopper from time to time. The Lil Tex is built with steel and has a durable powder coat finish. The grill grates are porcelain. While Traeger is a USA company this particular grill is manufactured in China. Having said that, Traeger are known to have great customer support, which is an important consideration when making a bigger purchase. If you want to look at some different models of Traeger, we have separate post on Traeger pellet grill reviews. As we mentioned, there are a few companies out there which are worth consideration when looking for mid-priced pellet grill. 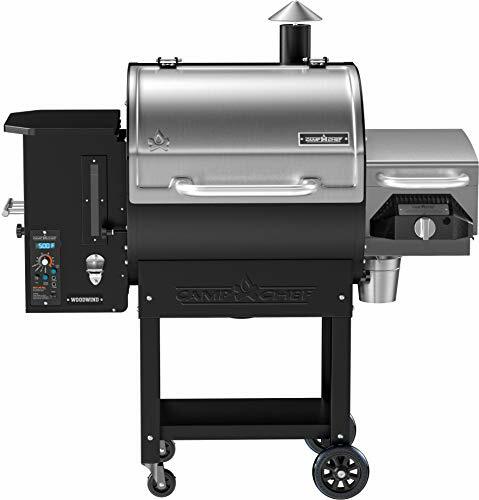 If you are in the market for a grill that is a little bigger but don’t want to go over the $1000 price point, then the CampChef Woodwind 24 is worth a look. The CampChef Woodwind is more expensive than the Traeger Lil Tex, however it offers significantly more cooking space, coming in with 811 square inches. This grill is easy to use, decent quality and represents good value at its price point. In our opinion, the big advantage of the Woodwind is that it offers a Sear Box. Like the Lil Tex, this smoker will also only reach temperatures of around 500°F in the main cooking area, so an included sear box saves you the hassle of sorting this out yourself. Let’s see how these two pellet grills compare. Lighter and more compact design. Great accessories available such as insulation blanket for use in cold weather and a fold down bench for extra preparation space, however these need to be purchased separately. Thanks to the Traeger Integrated Digital Elite Controller on this model, you can control the temperature within 20 degrees. 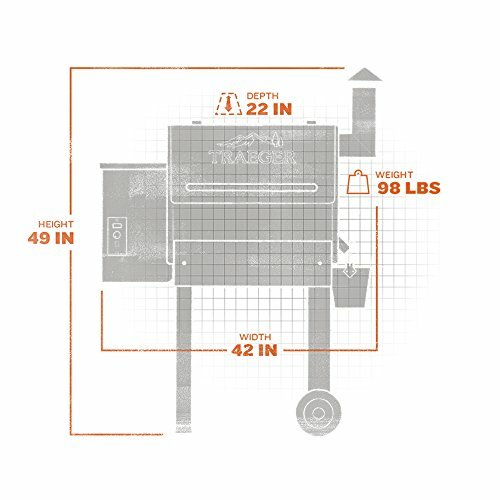 This is a bigger, heavier unit which has almost double the cooking space of the Traeger, coming in at 811 square inches. There is an inbuilt sear box, meaning it really is the only unit you need for outdoor cooking. 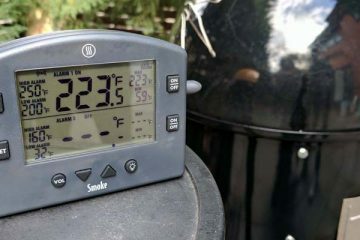 This smoker has a similar style temperature control system to Traeger, with the ability to adjust the temperature in 25°F increments. Both units are built quite well, however the quality is not quite up to the standard you can expect from the more expensive units. If you think you’ll regularly be cooking for a crowd, or need searing capability, we suggest you have a closer look at the CampChef Woodwind. 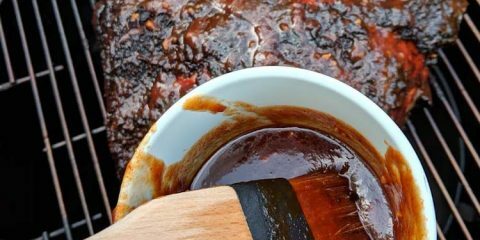 Mastering the skills and techniques needed to cook up an amazing barbecue can certainly be a very rewarding hobby. But some of us are short on time and patience. If you fall into that category, but are still keen to cook up some legendary barbecues at home, then the Traeger Lil Tex Elite 22 is a smoker worth considering. It is compact, yet has enough room under the lid to cook for a decent crowd. It offers set and forget cooking, meaning you won’t have to babysit the smoker all night while the meat cooks. It’s price reflects the quality of the product, yet is still reasonable if this is your first foray into smoking. 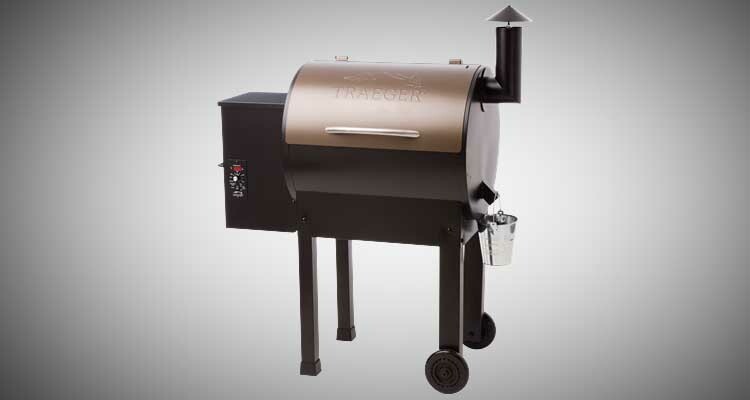 Check the latest price for Traeger Lil Tex Elite 22 on Amazon.